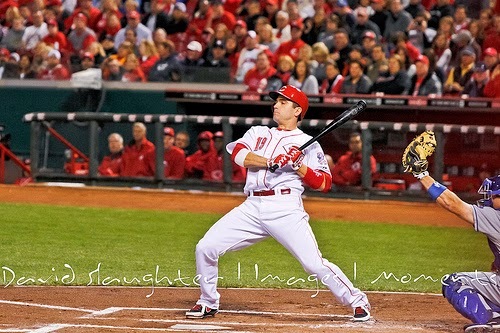 Joey Votto takes YET ANOTHER pitch. Somehow, despite posting yet another truly magnificent season that saw him rank second in the league in wRC+, and topping 6 WAR for the third time in the last four years, Joey Votto became a lightning rod for controvery last season. One of the things that has emerged from all of this is that many of his critics are arguing that he should hit second in 2014, rather than third. Their reasoning, I think, is that since he "doesn't drive in runs," and insists on getting on base at a league-leading pace, he should hit higher in the lineup and let others drive him in. While I hate the sentiment that's driving it (Votto is a brilliant player that we should be very thankful to have right now), I think it's actually a good idea to bat him second. The thing is, even during his MVP season with those magical 111 RBI's, I think Joey Votto should probably have hit 2nd. The reason? From a lineup optimality standpoint, the #3 hole usually NOT a very good place to put your best hitter. One of the biggest reasons is that, typically, the #3 slot in the lineup comes up with the bases empty and two outs more than any other slot. That's because they bat two spots after the leadoff guy, who (true to their name) will lead off innings an average of two times per game. That's the highest of any other slot, and thus, by definition, the #3 hitter will have more chances to bat with none on, two outs, than anyone else. This limits #3 hitter's ability to positively impact the game. Your best three hitters should hit 1st, 2nd, and 4th. Of those, the #2 hitter should be the best combination of on-base and power skills. The #1 hitter should have the best OBP. The #4 hitter should have the best power. Your next two best hitters should hit 3rd and 5th. Power is desirable from the #3 hitter, because he often will come up with two outs. All things being equal, the #5 hitter should be a bit better than the #3 hitter. Your remaining hitters should hit in decreasing order of quality. If you have a pitcher, it is often desirable to hit him 8th so that a quality hitter who can get on base hits in front of the top of your order. 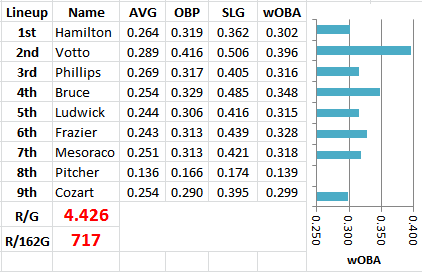 Similarly, with a DH, try to get a high OBP, low power hitter in the 9th slot. Let's run through the Reds 2014 lineup and do some lineup optimization with those principles in mind. I'll going to use my favorite Markov chain lineup tool that John Beamer released in the 2008 THT annual (hopefully used properly, unlike that other time) to calculate lineup effectiveness. 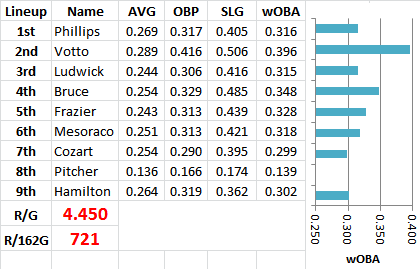 And we'll use ZIPS projections, in part because they're pretty bullish on Billy Hamilton (comparatively...). And we'll do all of this with the caveat that it's pretty unlikely that the Reds will do any of these things this year. Now, let's start optimizing, based on those rules of thumb above. 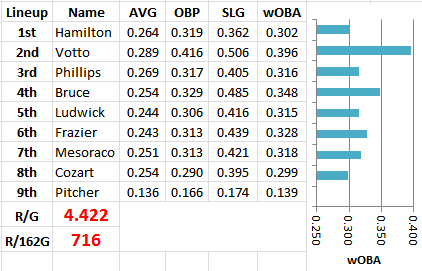 The Reds' three best hitters are clearly Votto, Bruce, and then one of Phillips, Ludwick, or Frazier, depending on your biases and preferred projection system (and hey, Mesoraco might also be in that group). Bruce is clearly the guy with the most pure power, so he fits as the cleanup guy. That leaves Votto in either the #1 or #2 slot. He could work very well in leadoff, but then you have a huge gap between he and Bruce. I like to cluster good hitters together so one is on base for the other to drive in. Furthermore, Votto's power is such that I'd prefer to hit him lower than leadoff. That pegs him into the #2 hole. According to the Markov, we gain 7 runs on the season by shifting him up a slot. Note that the Markov has no idea about his RBI totals; it's based on average production, period. Ok, so not much of an increase, but it's a slight improvement. Let's keep playing. Hamilton, while OBP-heavy, has the 2nd-worst projected wOBA among the Reds' starting eight, so he is not among our top-3 hitters. Let's move him down to 9th (his projected OBP 3rd-best, so he fits beautifully down there as a secondary leadoff guy) and get our best OBP guy among the Phillips-Ludwick-Frazier-Mesoraco group at the top of the lineup. While it's very close between them, but Phillips gets the call. It's a pretty defensible choice, really, and one that could work well given the hopeful return of his baserunning skills. And we picked up 4 more runs. Nice. Interestingly, Hamilton's projected OBP is better than Phillips'. Brandon's advantage is his power. Leadoff guys can hit homers too, sometimes even with men on base. And they get more at bats to do so than guys hitting lower in the lineup. Each step above was incremental. But overall, based on the Markov and these projections, we've improved the offense by ~13 runs (~1.4 wins, using 9.264 runs/win) on the season by simply rearranging the batting order. The biggest improvements came from getting our best hitter out of the #3 slot (7 runs) and then replacing a below-average hitter in the leadoff slot with an average hitter, albeit one who has a slightly worse OBP (4 runs). Teams paid ~$6 million per win this offseason, so overall, we're talking about an adjustment worth ~$8.4 million in free agent dollars. A 1-2 win improvement isn't a lot. That's why folks say that lineups don't matter much. But when you're a marginal team like the Reds, a 1-win improvement can be the difference between a playoff berth and going home at the end of September. Was Homer Bailey's Contract An Overpay?